If It's Too Loud...: 2 Acts Added to the Nines Festival! The Nines Festival, which already included Explosions In the Sky, Delta Spirit, Kid Koala, Matt Pond, Dr. Dog, Shuggie Otis, and Walk Off the Earth, just added two new acts to the bill: Brooklyn based rising hip hop star K. Flay and Boston's own Walter Sickert & The Army of Broken Toys. K. Flay is one of indie hip hop's fastest rising stars and will definitely appeal to "the kids." Walter Sickert & The Army of Broken Toys is less a band than an experience, with 7 musical members being joined by all manner of midway and burlesque performers. Both acts add something truly unique to an already diverse line up. 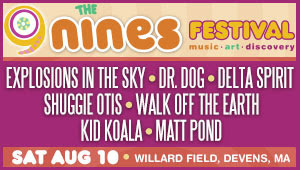 The Nines Festival takes place at Willard Field in Devens, MA on August 10. For more information, please check out their website. Early bird tickets end on July 7, so buy them now!